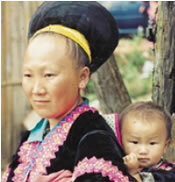 The Hmong, also known as Mong, are a people group from Southeast Asia, most notably from Thailand, Vietnam and Laos. In North America, the Hmong are subdivided into two distinct dialect speaking peoples: the Njua Hmong and the White (Daw) Hmong. Due to persecution and war, hundreds of thousands of Hmong refugees have fled their homelands to seek political asylum. They fled in two waves: one during the 1970s and the other since 2004. In North America, Hmong have faced many challenges: to name a few, lack of education, poverty, gang violence, and race relations. They also continue to stay in contact with Hmong people still residing Southeast Asia. Moreover, they serve as a voice for those still under persecution. Many Hmong, upon entering North America, converted to Christianity. However, subsequent generations have often waivered in living out their Christian faith, and consequently sometimes are in name only Christian. Pray Hmong will have both their spiritual and needs met: including their needs for education, escaping poverty, and gangs becoming Christians. Pray Hmong will experience revival and renewal in order to spread the Gospel message to the least reached people groups. Pray God will call Hmong to cross their own culture and and minister among the least reached people groups.